“Cognition-Stroll” Annette Cords and Becky Brown, Project: ARTSpace, installation view. The exhibition title “Cognition-Stroll” is a literal translation of the German compound noun Erkentnisspaziergang, understood as the attainment of insight through the practice of walking. 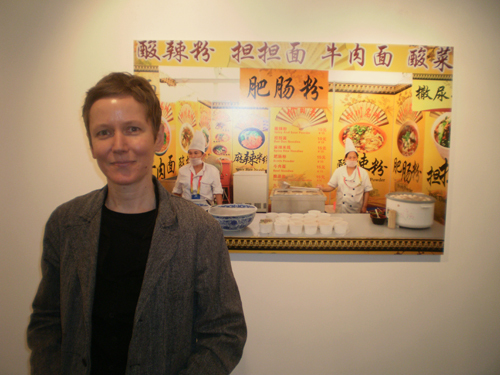 The artists Annette Cords and Becky Brown are women with long ties to New York City. Cords, originally from northern Germany, maintains close contact with friends and family there but is more accurately a New York artist, while Brown is a native New Yorker, born in Manhattan and currently working in the Bronx. 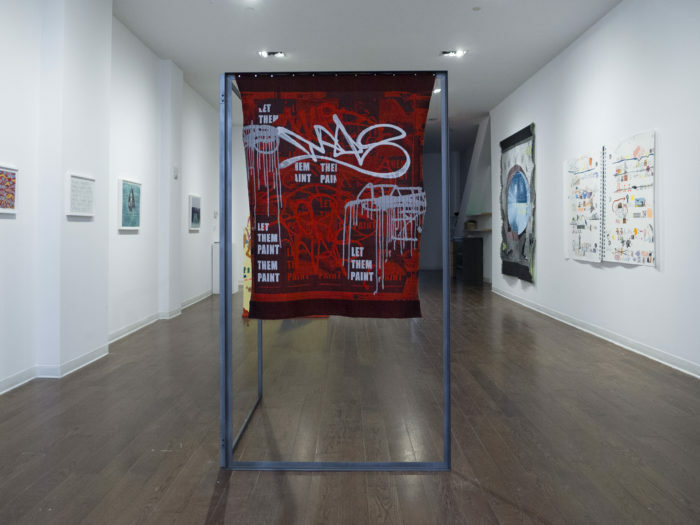 As the name of the show suggests, their works recognize New York and its streets as a site of insight and inspiration. The collective creativity of the city—its signs, logos, accidental poetry, graffiti, and random marks—make it a place of complexity and contradiction. The coexistence of so many, frequently conflicting visual elements present a range of meanings. No single reading is possible and both Brown and Cords’ work inhabits a similar multivalent space. Reinvention is a constant in New York—ideas and places are recycled, repurposed, and reclaimed. What belonged to the street can be found in a boutique; what was popular culture becomes a highly bankable commodity. The messy visuals of the sidewalk have resulted in some remarkable art. Rauschenberg’s pulsing, anarchic sensibility has memorialized the experience of urban density and chance. There is no way that an artist can completely rework these unorganized details into a rational framework. The details are always messy, but by picking and choosing those urban visuals useful to us, the life of the street is transformed into something else: the production of a cultural artifact that is just as effective as experience but presents its insights with acuity and, sometimes, even grace. 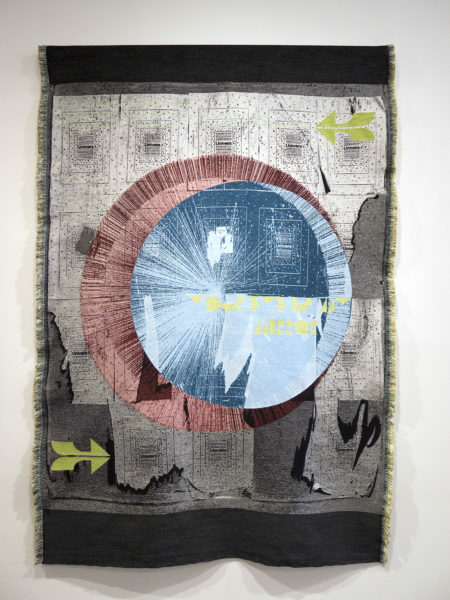 In her work, Cords combines a variety of media, from painting to weaving and installation. 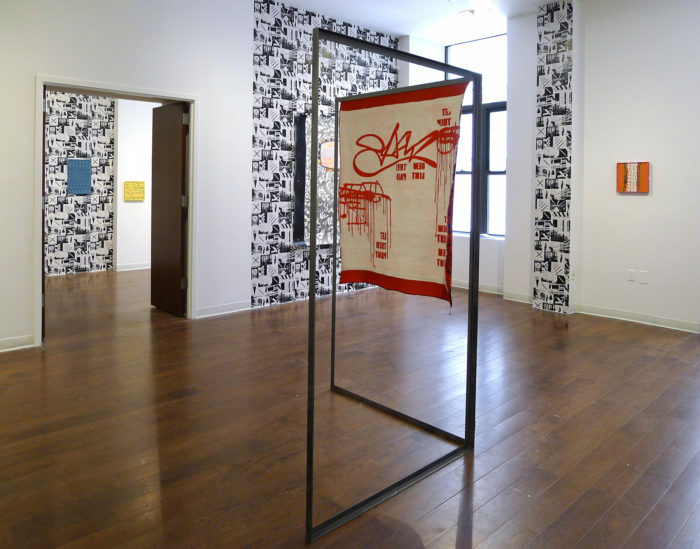 In Let Them Paint (2016), a hand-woven tapestry, the red ground includes white and gray graffiti tags along with extended, dripping paint blobs. Looking closer, we see the paint blobs are comprised of curving lines reminiscent of Op Art patterns. 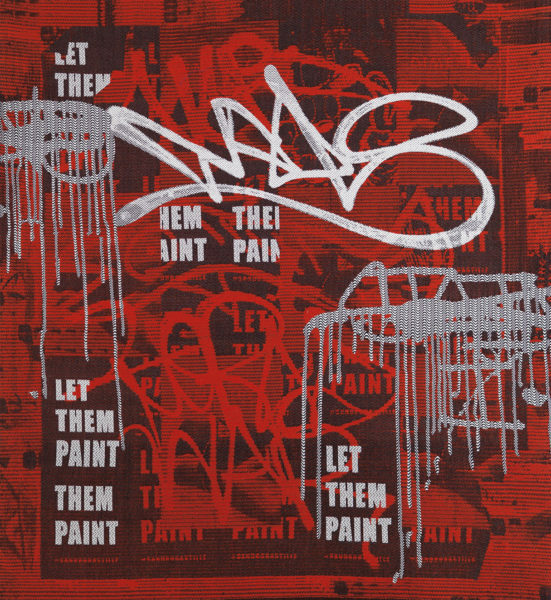 The phrase “LET THEM PAINT” is repeated in gray on top of a palimpsest with straight horizontal lines. 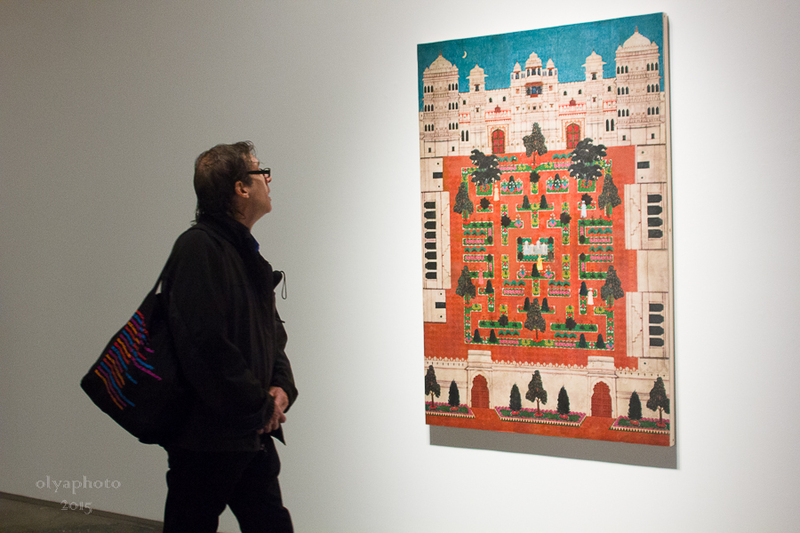 The tapestry is hung from a metal structure consisting of two tall, rectangular supports. Its back is nearly as interesting as its front; we see the graffiti, drips, and phrasing in reverse, on a white background. So what are we to make of the worded recommendation “Let Them Paint” and the imagery? 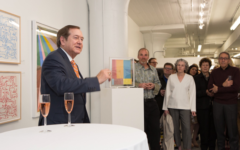 It may be seen as a challenge, an invitation, and a call to action—perhaps a demand for open, common spaces that can be claimed, or an allegiance to the power of painting. 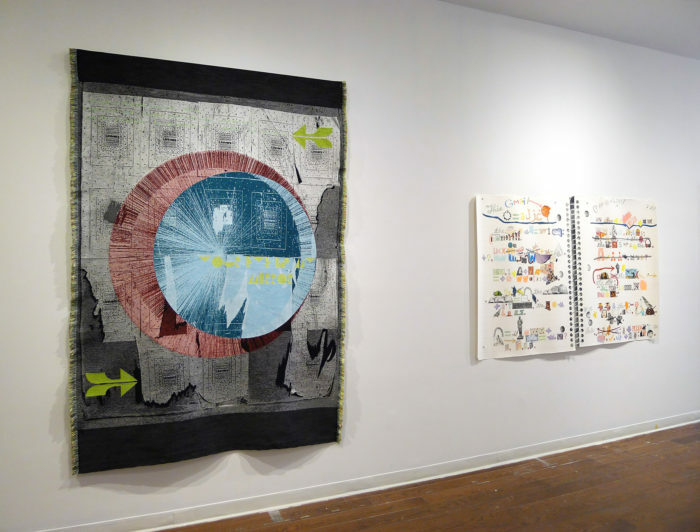 It also points to connections between painting and tapestry and how these disciplines are intertwined. 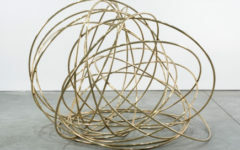 Cords transforms and merges text, drawings and images in her work. The interaction of sources highlights the power of reconfiguration and exchange—much like the movement and chance encounters inherent to the New York streets. 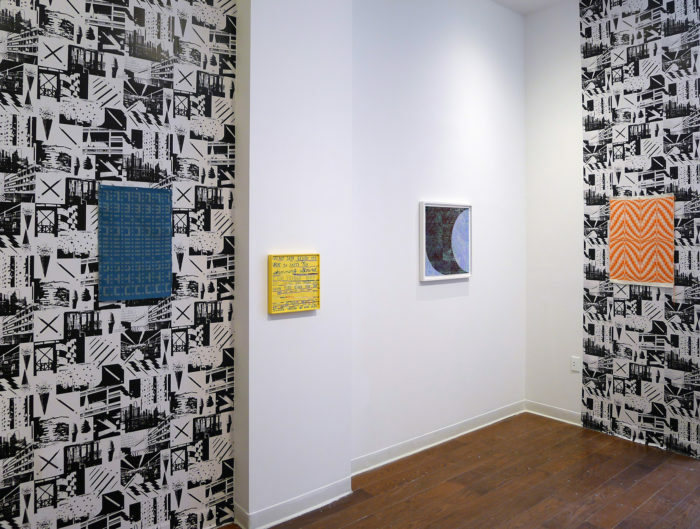 It also presents authorship as a collective endeavor, which makes space for multiple voices and views. In Brown’s work, we see the artist move toward the visual realization of a complex space structured by language and the dense fabric of urban life. 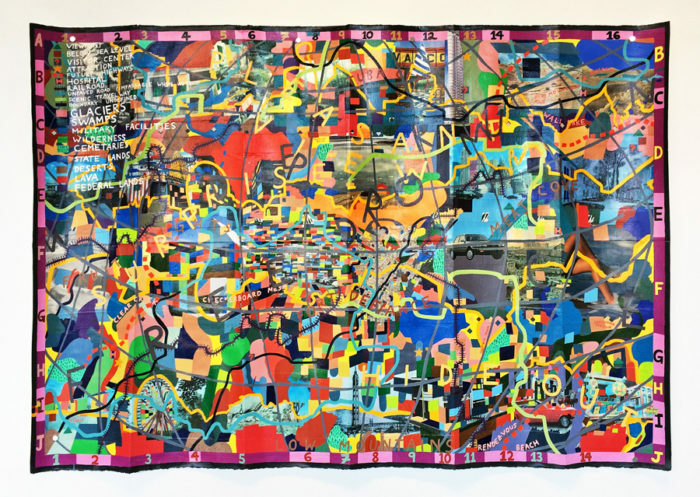 In Pleasant View (2016), a mixed-media work on paper, the viewer encounters a busy, densely filled composition in which brightly colored squares and small patches compose a mosaic that could easily describe the environs of a city—but just as easily work as intersecting, abstract patterns. In the upper-left corner, words like “military,” “glaciers,” and “swamps” form a multi-directional key to this map-like space, while larger letters are strewn over the surface suggesting place names and offering more examples of the “accidental poetry” both artists seek out. Pleasant View feels like the rendering of a specific place, and in fact, there is a community with that name in Queens. However much the painting owes to geographical particulars, it is also a study in nonobjective structure, in which discrete bits of color fill the compositional space, creating a kaleidoscope of forms. Straddling cartographic conventions and various art historical traditions, it is, like all maps, both abstract (as an image) and representational in the most literal sense. It is an image that celebrates the visual joys of urban life, both complex and exuberant. As the visitor makes his way though the exhibition, he is struck by the continuing intensities of life in New York—even when those intensities are linked to class differences and the hopelessness of poverty. Beauty in the city is found in the strangest places—in garbage dumps, rusted cars, cracked windows. But then ever since romanticism, artists and writers have been attracted to ruins and desolate places. In a fair amount of Cords’ art, though, we find a sense of design that lifts the artwork into a place of transparent, high energies that reject the city landscape for something more elevated. In Cords’ 2017 tapestry Your Eye Is My Mirror, a silver-blue eye holds our attention in the center of its space. This image is almost completely surrounded by a pale-red nimbus. 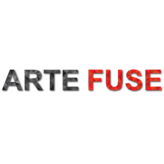 Both have straight lines radiating from their center; beyond them are a series of abstractions—a stylized arrow on the bottom left, a series of rectangles drawn with thin lines. All in all, the work is masterly—and very beautiful—in its composition. 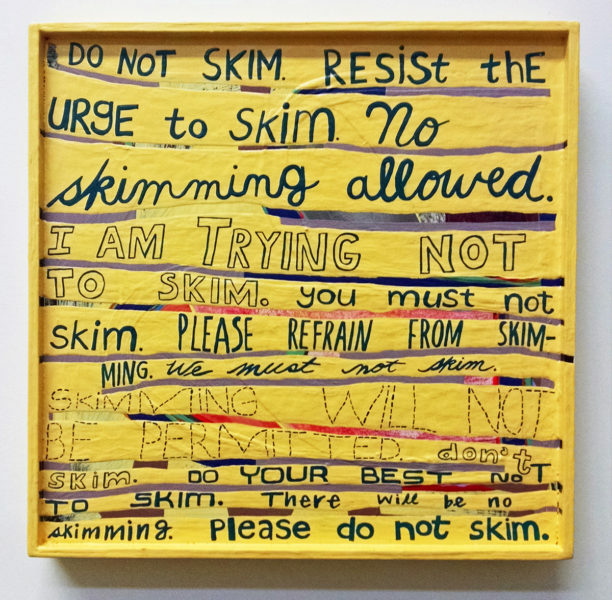 Brown’s predilection for words in art finds a logical conclusion in the painting I Am Trying Not to Skim (2015), which consists of the sentences “Do not skim,” “Resist the urge to skim,” “No skimming allowed,” etc. Painted with black letters on a dull yellow, wooden ground, this exercise in closely related phrasing is akin to the misbehaving child repeating corrective phrases on a blackboard. In this case, that child may be all of us – skimming over articles and emails and too often paring down complex ideas into texts and tweets. The work may be read as a plea to the culture at large to slow down, look and read more closely in hopes of deeper understanding, empathy and pleasure. There may be another layer of reference to corrupt government—most Americans know the phrase “to skim off the top”—and this concept is at the forefront of the national consciousness today. Maybe this double meaning is a good way to end our reading of the varied works in the exhibition: city life, in its chance encounters and constant change, resists rational explanation and lends itself to multiple, even conflicting, interpretations. Signage is ubiquitous in urban neighborhoods, either as chance letters or phrases written as graffiti, or as advertising. Cords’ tapestries reinvent city visuals within an idiom of considerable age and weight, while Brown improvises across a concrete landscape. Both artists quite compellingly capture the spirit of the city in these unique times. “Cognition-Stroll” Annette Cords and Becky Brown at Project: ARTSpace until July 28th, 2017. What to do when everything is Made in China?